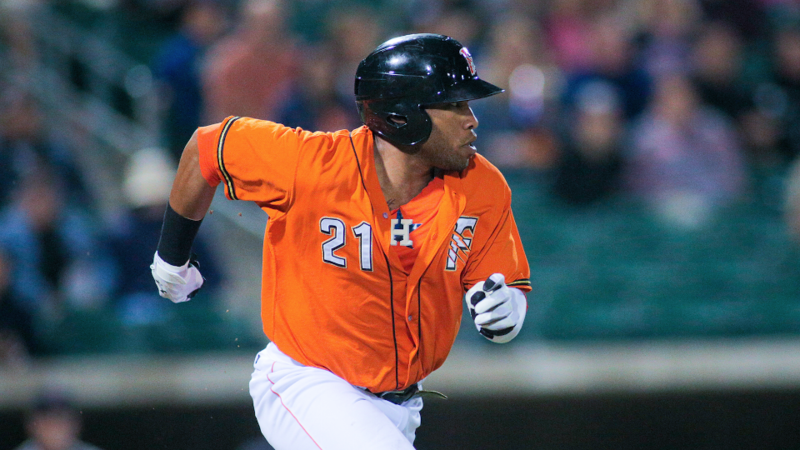 ALBUQUERQUE, N.M. - If Pacific Coast League fantasy baseball existed, Jon Singleton would've made owners very happy Wednesday night with his record-setting performance. He went 4-6 with a grand slam, two-run homer, and a franchise record 10 RBI in the Fresno Grizzlies (18-15) 17-6 win over the Albuquerque Isotopes (13-21) in front of 6,842 fans at Isotopes Park. The 17 runs mark the most by a Grizzlies team since scoring 24 against Sacramento (#Wackramento) on August 25, 2006. Tonight's win, combined with a River Cats loss earlier today, puts the Grizzlies 1.5 games ahead in the Pacific Northern Division and gives them six wins in their last eight games. Singleton hit a two-run single in the first, a grand slam in the second, a two-run homer in the third, struck out swinging with two on in the fifth, smacked a RBI single in the sixth, and lined out to right field in the ninth. The performance was historic, as Singleton fell just one RBI shy of the Pacific Coast League modern day record set by Mike Moustakas. Over the last three games, he's smacked two grand slams and a three-run homer on way to 18 total RBI. The efforts have propelled him to lead all of Minor League Baseball in home runs (11) and RBI (35). Interestingly enough, three of the top four RBI leaders in Minor League Baseball are on or have played for the Fresno Grizzlies this season. Besides Singleton, the other two are Carlos Correa who joined the club Tuesday, and Preston Tucker, who began the season with Fresno before being promoted to Houston. Isotopes' lefty Tyler Matzek had a recipe for disaster as he walked four straight batters to begin the game and the first three batters of the second. All in all, Fresno pushed nine runs across in the first two innings and came back with four more in the third to jump out to a 13-2 lead. L.J. Hoes went 1-2 with three RBI, three walks, a hit-by-pitch, and five runs scored. Domingo Santana extended his season-high hitting streak to nine games by going 2-3 with three RBI, three walks, and two runs scored. Asher Wojciechowski made his second start of the season for Fresno and allowed four runs on eight hits over 5.0 innings to pick up the win. Jonas Dufek followed and surrendered two runs over 2.0 innings, but Tommy Shirley and Tyson Perez combined to hold Albuquerque scoreless over the final two frames. An early 10:05 a.m. PT ballgame awaits Thursday as lefty Luis Cruz takes the mound for Fresno and faces fellow southpaw Chris Rusin. The action can be heard locally in Fresno on KYNO-AM 1430 or streamed online at KYNOFresno.com. For more information on the club and their upcoming eight-game homestand that begins on Thursday, May 21st, visit FresnoGrizzlies.com.